Magnificent estate situated in the midst of a picturesque, characteristic landscape. The estate is located on a waterway and is fully surrounded by farmlands with poplar and willow avenues, providing complete privacy. 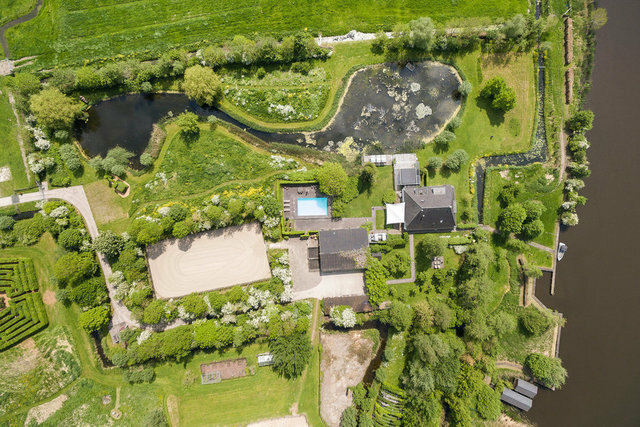 With its own harbour, boathouse and a verdant landscaped garden, as well as farmlands, stables, outdoor arena and outdoor swimming pool, this spot is ideal for those who love space, water sports, peace and quiet and nature. The former farmhouse was completely transformed into a luxury villa in 2009, designed with the aim of giving everyone their own place to relax, as well as providing pleasant family rooms. A special feature of the estate is that it has its own 1-km driveway. Privacy guaranteed!